An attractive plant with clusters of brightly coloured trumpet-shaped flowers, standing tall above its elegant and symmetrically arranged foliage. It’s considered as the ‘Queen of Houseplants’ for its striking beauty, durability and reliability. Typical floral colour is a brilliant orange with yellowish throat that contrast fabulously with its dark green foliage. But, of course, other pastel and darker shades are available too and as catchy. Simply beautiful and spectacular as an indoor plant or outdoors in the garden. And, it’s popularly sought after because of its ease of care. Etymology: The genus name, Clivia, was named by John Lindley in 1828 to honour the Duchess of Northumberland, Lady Charlotte Clive who first cultivated the type specimen in England. Miniata, refers to the red-lead colour of the species’ flowers. 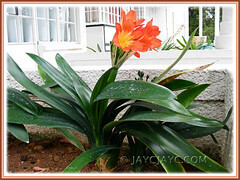 Learn more about the history of Clivia from the Clivia Society, South Africa. Origin: Native to Kwazulu-Natal, Eastern Cape, Mpumalanga and Swaziland in southern Africa. 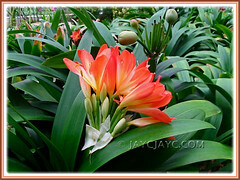 Features: Clivia miniata belongs to the genus Clivia which consists of six known species and it is the most widely cultivated species among the lot. Though endemic to the moist and shady forest floors of southern Africa, they’re popularly cultivated worldwide for their beautiful and long-lasting blossoms. To date, there are numerous hybrids and cultivars due to extensive breeding over the centuries. It is a clump-forming herbaceous perennial that suckers freely and reaches to a height of about 80cm. An evergreen beauty that produces glossy and dark green leaves which arise from a thickened underground stem with fleshy or bulbous root system. Its elegant and arching leaves are strap-shaped with tapering tips, varying in width and length that range between 5-9cm wide and 60-90cm long. These dense tufts of sessile leaves appear in opposite and alternating sequence, distichously arranged in a beautiful fan-like appearance and creating a stout pseudo-trunk at the base, similar to Agapanthus (African/Blue Lily), another beautiful native of South Africa. Its striking clusters of trumpet-shaped blossoms are borne on an erect and thick flowering scape, up to 60cm tall or more. The large and showy umbels will typically comprise of between 12-20 flowers, though has known to number in excess of 40 flowers, in varying shades. Beside the usual brilliant orange with yellowish centers, flower colours vary from the pastel shades of white, cream, yellow, apricot and peach to the darker shades of yellow, orange, orange-red, scarlet, dark red and salmon. Flower shapes and number of petals differ too, depending on the cultivars. In the tropics, it blooms sporadically year round but in frost-free regions, from early spring to early summer. Fruits are produced after flowering, taking almost a year to turn to a bright orange and ripen, and contain seeds that can be sowed. Culture (Care): Clivia miniata is an easy-to-culture plant that needs minimal attention yet rewards handsomely with catchy flower clusters. Light: Partial to full shade. Indoors, it needs bright light for healthy growth and flowering, and outdoors in dappled shade, preferably filtered morning sunlight. Strictly no direct sunlight which will scorch and yellow its foliage. Moisture: Average water needs. Water regularly during the growing season, allowing the top half of soil to dry out between deep watering. Do not overwater, it dislikes wet feet and soggy conditions that can cause rot. It dislikes high temperatures too but tolerates dry air, so misting is unnecessary. Soil: Prefers a humus or organic-enriched potting medium that must be well-drained and can provide good aeration which is essential for its best growth. Others: Plant with the crown just below soil surface level, never too deep. Feed once monthly with a liquid flowering houseplant fertilizer during active growth and flowering. Remove spent flowering stalks at the base, as well as withered or scorched leaves. 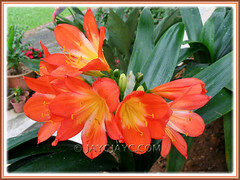 Clivia miniata flowers best when potbound and dislike root disturbance that may temporarily stop flower production. So, repot only when necessary after flowering, probably every 6-10 years when it becomes overcrowded with the fleshy roots pushed way up above the potting mix. If flowering scape fails to elongate, with flowers blooming between basal leaves (as seen in one of the photos above), it’s probably due to improper rest period or potassium deficiency. Relatively free from serious pests and diseases, though watch out for mealy bug and scale. For subtropical and temperate regions: Hardiness: USDA Zone 9-10, where it grows well outdoors in frost-free regions. It is frost-sensitive, so best to plant in containers that can be overwintered easily indoors for non-hardy regions. During its active growing season in early spring through fall, water regularly, feed monthly and maintain moderate temperatures. In winter, during its resting period, water sparingly, withhold feeding and keep it cool. Read about growing/cultivating C. miniata from gardeners at various USDA Zones at Dave’s Garden and from the Gay Gardener. Propagation: By seeds which will take up to 3 months to germinate and probably more than 3 years to flower. An easier alternative method of propagation is by division of clumps or by removing the suckers (offsets) when repotting, which is best done when plant is potbound. 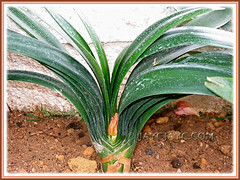 Usage: Clivia miniata make ideal groundcovers in garden beds and borders, located beneath shady trees or any shady site, giving interest, brightness and beauty to the landscape. Excellent ornamental houseplant in containers to decorate and brighten homes or indoors, window sills, patios and decks. Its long-lasting flowers which has a vase-life of about 2 weeks are ideal as cut flowers. 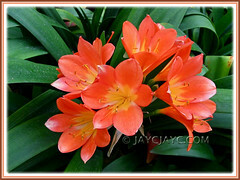 In South Africa, Clivia miniata is known to be used for traditional medicine – the rhizomes or tuberous roots are used to relief fever and an infusion of its leaves to induce labour and speed contractions. Also, used as a snakebite remedy and to relieve pain. More at NCBI-PubMed. I really love your Bush Lily. How long did you keep it to bloom? I had recently force bloomed my Amaryllis. Do check it out & let me know what you think? James, too bad the lovely Bush Lilies displayed above aren’t ours…they were captured in Cameron Highlands during a short vacation last year. Would love to visit your garden tomorrow…too tired and sleepy to enjoy them now at almost 1am! These lilies are really lovely. I like this shade of orange. Autumn Belle….I agree, they’re truly striking! I remember seeing a white variety of this species at your blog some months back..I like the purity of that shade too! This Bush Lily is stunning. The orange color would definitely add a tropical punch to any garden. Just to let you know that I love your article on the vivid red roses and attempted to drop a comment but twice rejected with an error message?